BUCHAREST, Romania — Just a few minutes on foot from the bustle of downtown Bucharest, the State Jewish Theater, down a small side street in the Romanian capital, cuts a forlorn figure. 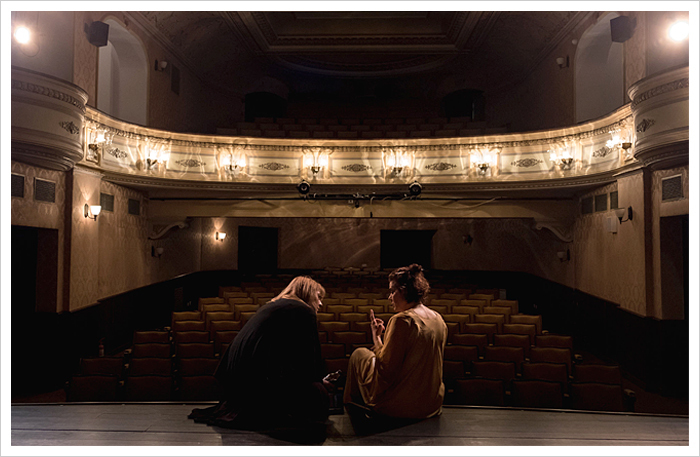 Yet the theater is one of the few vestiges of what was once a large Jewish community in Romania, and one of the few professional Yiddish-language theaters left in Europe. In 2014, heavy snowfall literally brought the roof down, causing the theater to close for two years. It reopened to the public in November, its roof fixed, its interior freshly painted and the decades-old wiring finally replaced. "The last two years it was difficult to survive", said Maia Morgenstern, the theater's manager and an actress who played Mary in Mel Gibson's "The Passion of the Christ". "We performed here and there. Other theaters, public libraries." In early January, the theater staged "Warsaw: Tourist Guide," a tragicomedy set in the period after World War II, when Jewish families returned to Poland to try to reclaim their property. Despite thick snow blanketing the city, there was a full house. The first Jewish theater in Romania was founded in the 1870s in the eastern city of Iasi. The current theater in Bucharest was established in 1940 and remained open throughout the war even as Romania was in the grip of anti-Semitism and many Romanian Jews were sent to labor camps. Romania was an ally of Nazi Germany until it switched sides in 1944. During the war years, Jewish actors and playwrights who were forbidden to perform elsewhere came to ply their trade, though they were not allowed to perform in Yiddish. Later, during the Communist period, Nicolae Ceausescu, the authoritarian leader who governed Romania from the mid-1960s to 1989, tore down much of the old Jewish neighborhood to make way for his grand, Soviet-style architectural vision for the city. "Ceausescu demolished all of this neighborhood," said Ms. Morgenstern, in her backstage office recently. "Nothing but this theater stayed. Another house, another street, demolished, demolished. It was an ocean of ruins." She added: "They didn't demolish the theater, but it was in a very bad state. No heat, improvised electricity. It was almost a ruin. It was difficult to get here, for us and the audience." Though the Communist authorities allowed performances in Yiddish, actors used the fact that many audience members relied on translations to get around some of the tight censorship. "Because we were talking Yiddish on stage, we could say things that weren't allowed to be said in Romania," said Rudi Rosenfeld, 75, a Jewish actor who has been involved in the theater since the late 1940s. "The audience had headphones on and our colleagues were translating into Romanian, but they would skip the sensitive parts," he added. Now, subtitles are provided on portable screens. By the late 1980s, most of the city's Jewish population was gone. 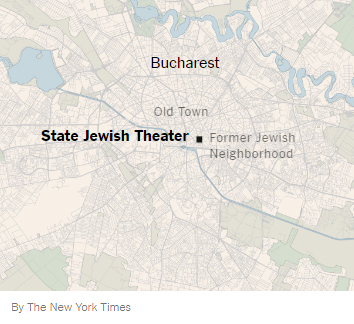 The area around the theater, once a bustling Jewish neighborhood, had gradually lost its Jewish ties. The war years and, later, the country's decision to allow large number of Jews to emigrate en masse to Israel in exchange for Israeli money and assistance, depleted the local Jewish population. Most who had remained left after 1989, when the regime fell. It is estimated that the Jewish population in Romania today is less than 11,000, down from around 800,000 before World War II. In Bucharest there are just a few thousand Jews left. "There is no Jewish neighborhood now, just drawings on a map," said Gilbert Saim, an official at Choral Temple, one of the few Jewish houses of worship left in the city. Wandering around the neighborhood, it is easy to miss the few remaining signs of the area's Jewish history: just a handful of religious buildings, often hidden behind ugly apartment blocks, and the theater itself. From the outside, the theater, which became an official state institution in 1948, barely hints at its legacy or, beyond "Teatrul Evreiesc," or Jewish Theater, written in vertical red letters, its current role. It is unlikely to feature prominently on any list of Bucharest's cultural institutes. Yet inside, the 250-seat hall offers classical decoration and rich acoustics. "I've played on Broadway and regional theaters all over the States but this theater, the proportions and acoustics are fantastic," said Allen Lewis Rickman, an American actor who performed at the hall during an international Yiddish festival held in late November. 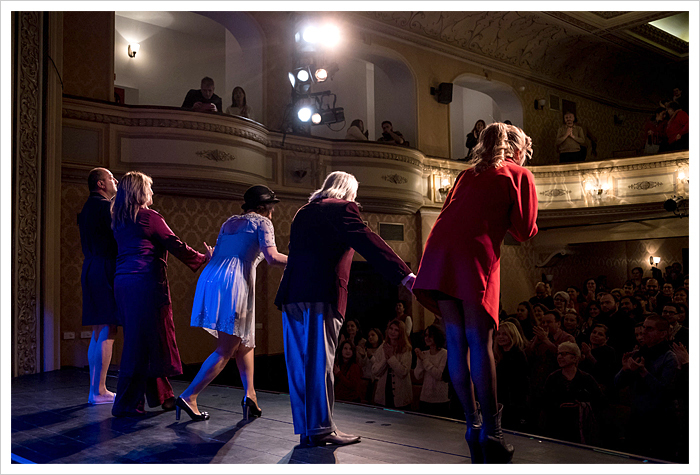 "I worry about the survival of professional Yiddish theaters," she said, noting that Bucharest, Warsaw and Moscow probably have the last remaining professional Yiddish theaters in Eastern Europe. "We want to continue our tradition of speaking and performing in Yiddish. I don't want to transform this theater into a museum; it is very much alive." With few Yiddish speakers left in the country, audiences have been reluctant to see performances that seem so alien to today's Romania. Ms. Morgenstern admits that there have been times when there were more actors on stage than people in the audience. "We have performed for two people," she said. But in recent years, before the roof collapsed, they had been playing to much fuller houses. Most of the actors had to learn the language before taking the stage. "It was a major challenge to learn Yiddish," said Anka Levana, 32, who has been performing with the theater for a decade. "It took two or three years before I was truly comfortable." Despite these challenges, there is a determination to continue the theater's legacy. When the roof collapsed, the actors, not wanting to admit defeat, laid out a platform in front of the theater, put up some lights and performed surrounded by snow. "I'm not sure if it was a protest or not, but we were saying we have no place to perform. We want to perform, we have something to show, but no place," Ms. Morgenstern said. Local officials listened, finding the money needed to repair the building. Now the challenge is to keep the traditions alive, while also engaging with a new generation of theatergoers. "When I started in this place I was 18 years old," Ms. Morgenstern said. "Now I am 55. I've always thought another two years and this theater will die." She added with a smile: "This thought has lasted for 36 years now." A version of this article appears in print on January 16, 2017, on Page A4 of the New York edition with the headline: Keeping Alive a Romanian Haven of Yiddish Culture.